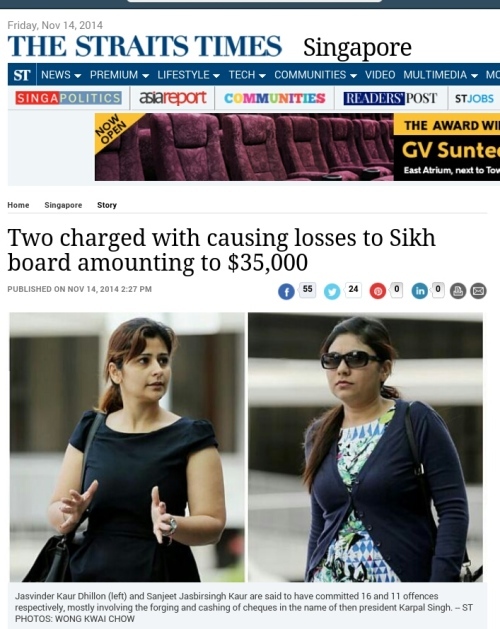 Two former clerks with the Central Sikh Gurdwara Board (CSGB), which administers two temples here, were hauled to court on Friday to face charges for some $35,000 in losses they allegedly caused to the board in 2010, reports Singapore’s Straits Times. In a report today (Nov 14), it said Malaysians Jasvinder Kaur Dhillon, 29, and Sanjeet Jasbirsingh Kaur, 34, are said to have committed 16 and 11 offences respectively, mostly involving the forging and cashing of cheques in the name of then president Karpal Singh. Engaging in a conspiracy together, they allegedly also prepared a voucher for an internal audit that falsely stated that payment had been made to a stationary supplier. Except for the five forgery charges that Dhillon faces alone, involving almost $11,000, she and Jasbirsingh Kaur are believed to have acted together on 10 other occasions, it said. Twice, they allegedly submitted a false payment voucher and supporting documents so Mr Singh and then treasurer Manjeet Singh would authorise the issuing of some $3,700 in cheques, the report added. The CSGB manages and operates the daily running of two Singapore’s Gurdwaras –Central Sikh Gurdwara at the junction of Towner Road/Serangoon Road and the Silat Road Gurdwara along Jalan Bukit Merah, according to information on the board’s website. The board was formalised through the enactment of the Central Sikh Gurdwara Board Act of the Singapore Parliament which incorporated the Central Sikh Gurdwara Board. It is a gazetted statutory board recognised by the Government of Singapore, the information added. Dekh ke anditth Keetah is NOT a pointer to Sikhs to close one or both eyes..ignore..stay away etc. This part of the Ardass is about those Sikh martyrs who could “see” DEATH staring in the face if they did not “convert” to islam. Among the Hundreds of thousands of Sikh who faced this Dilemma….each and everyone…ALL to a complete 100% ( including Children as young as 5years old Fateh Singh son of Guru Gobind Singh, 7 year old Zorawar Singh son of Guru Gobind Singh and 7 Year old Harkirat Singh in Banda Singh’s Camp..decided to “ignore Life as a convert” and FACE DEATH by Torture to keep their faith as a SIKH.Dekh ke anditth keetah is not an advise for a Sikh to shut his eyes, mouth, etc when he sees a wrong being done, a crime being committed, or ignore such acts. I agree such acts could have been “settled” behind closed doors..BUT then again such closed doors will actually Encourage many more…after all if caught..NOTHING HAPPENS..its settled amicably ?? I agree 110% with the action to NAME AND SHAME such cheats….as a dire warning to others who may think of doing the same…such acts are actually very very common..and remain hidden..shameful but necessary. Is it necessary to publicly humiliate people. Would our Gurus have condoned this humiliation? Asia Samachar what were you thinking! 1. Ours is a small community. Would it have been better to have counseled & even ‘punished’ these ladies behind closed doors for the sake of Sikh Community Reputation Management, instead of having them charged publically? 2. What would have our Guru Jis done, had some Sikhs been caught doing ‘wrong’ acts? 3. Finally, in our daily communal Ardas, we loudly proclaim the greatness of Sikhs who “dekh keh andhit kita”; loosely translated by some as “ignored in compassion, the mistakes of others”… Have we lost this compassion as a community for our fellow sangat? Why was this matter not settled amicably. It is shameful of the Sikh Council of Singapore to bring this into the public attention. More so for all Sikhs throughout the world. My best advice is that the natter to be settled behind close doors without further delay.